This article is about the ancient Greek school of thought. For other uses, see Ionian School (disambiguation). 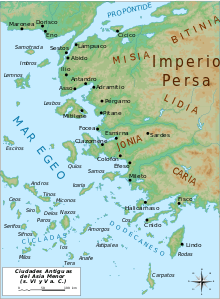 Map of ancient Ionia, on the eastern side of the Aegean Sea. The Ionian school, a type of Greek philosophy centred in Miletus, Ionia, in the 6th and 5th centuries BC, is something of a misnomer. Although Ionia was a center of Western philosophy, the scholars it produced, including Thales, Anaximander, Anaximenes, Heraclitus, Anaxagoras, Archelaus, and Diogenes of Apollonia, had such diverse viewpoints that they cannot all be thought of as having belonged to one particular school of philosophy. Aristotle called them physiologoi, meaning 'those who discoursed on nature', but did not group them together as an "Ionian school". The classification can be traced to the second-century historian of philosophy Sotion. They are sometimes referred to as cosmologists, since they were largely physicalists who tried to explain the nature of matter. Thales (Greek: Θαλῆς, Thalēs) of Miletus (ca. 624 BCE - 546 BCE) is regarded as the earliest Western philosopher. Before him, the Greeks explained the origin and nature of the world through myths of anthropomorphic gods and heroes. Phenomena like lightning and earthquakes were attributed to actions of the gods. By contrast, Thales attempted to find naturalistic explanations of the world, without reference to the supernatural. He explained earthquakes by imagining that the Earth floats on water, and that earthquakes occur when the Earth is rocked by waves. Thales' most famous belief was his cosmological doctrine, which held that the world originated from water. Anaximander (Greek: Ἀναξίμανδρος, Anaximandros) (610 BCE – ca. 546 BCE) wrote a cosmological work, little of which remains. From the few extant fragments, we learn that he believed the beginning or first principle (arche, a word first found in Anaximander's writings, and which he probably invented) is an endless, unlimited mass (apeiron), subject to neither old age nor decay, which perpetually yields fresh materials from which everything we can perceive is derived. Heraclitus (Greek: Ἡράκλειτος, Hērakleitos) of Ephesus (ca. 535 - 475 BCE) disagreed with Thales, Anaximander, and Pythagoras about the nature of the ultimate substance and claimed instead that everything is derived from the Greek classical element fire, rather than from air, water, or earth. This led to the belief that change is real, and stability illusory. For Heraclitus "Everything flows, nothing stands still." He is also famous for saying: "No man can cross the same river twice, because neither the man nor the river are the same." Empedocles (Greek: Ἐμπεδοκλῆς, Empedoklēs) (ca. 490 BCE – ca. 430 BCE) was a citizen of Agrigentum, a Greek colony in Sicily. Empedocles' philosophy is best known for being the origin of the cosmogenic theory of the four classical elements. He maintained that all matter is made up of four elements: water, earth, air and fire. Empedocles postulated forces called Love (philia) and Strife (neikos) to explain the attraction and separation of different forms of matter. He was also one of the first people to state the theory that light travels at a finite (although very large) speed. Anaxagoras (Greek: Ἀναξαγόρας) of Clazomenae (ca. 500-428 BCE) regarded material substance as an infinite multitude of imperishable primary elements, referring all generation and disappearance to mixture and separation respectively. All substance is ordered by an ordering force, the cosmic mind (nous). Archelaus (Greek: Ἀρχέλαος, Arkhelaos) was a Greek philosopher of the 5th century BCE, born probably in Athens. He was a pupil of Anaxagoras, and is said by Ion of Chios (Diogenes Laërtius, ii. 23) to have been the teacher of Socrates. Some argue that this is probably only an attempt to connect Socrates with the Ionian School; others (e.g. Gomperz, Greek Thinkers) uphold the story. There is similar difference of opinion as regards the statement that Archelaus formulated certain ethical doctrines. In general, he followed Anaxagoras, but in his cosmology he went back to the earlier Ionians. Hippo (Greek: Ἵππων, Hippōn) (ca. 425 BCE) was a native of Magna Graecia (Italy). Very little is known about him. He held that water was the principle of all things, with fire springing from water, and then developing itself by generating the universe. Primarily interested in biological matters, he was said to have been an atheist. Diogenes (Greek: Διογένης, Diogenēs) (ca. 425 BCE) was a native of Apollonia, Thrace. Like Anaximenes, he believed air to be the one source of all being, and all other substances to be derived from it by condensation and rarefaction. His chief advance upon the doctrines of Anaximenes is that he asserted air, the primal force, to be possessed of intelligence—"the air which stirred within him not only prompted, but instructed. The air as the origin of all things is necessarily an eternal, imperishable substance, but as soul it is also necessarily endowed with consciousness."